At LJ Crafted Wines we’re taken the greener path by introducing an efficient and earth-friendly way to consume wine that you can feel good about. We have created a way for the wine industry to be more environmentally friendly. Our patent-pending technology enables us to serve our wines direct from the barrel into reusable growlers. This process avoids the high energy production & disposal required for traditional single-use wine bottles. LJ Crafted Wines prides itself in offering wines with a lighter carbon footprint, and at the same time, supporting a zero-waste lifestyle. Selling wine and not packaging is our modus operandi. With wine growlers clearly making environmental sense plus being readily accepted by their clientele, LJ Crafted Wines decided in September 2017 to only offer wines via the wine growler program so establishing itself as a “wine filling-station”. 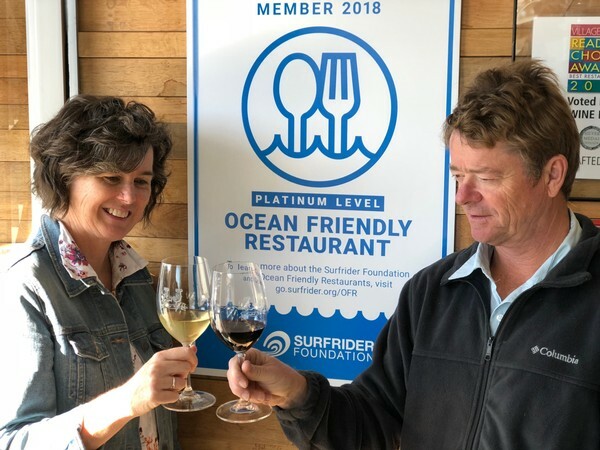 On Friday, January 19th 2018, the San Diego County Chapter of Surfrider Foundation welcomed LJ Crafted Wines as their first fully registered Platinum Level Ocean Friendly Restaurant (OFR) in San Diego. The goals of the OFR program are to help reduce plastic waste, eliminate the use of expanded polystyrene (EPS), and to encourage more sustainable and environmentally friendly practices in the food and wine industry. Restaurants that meet all 10 program criteria gain Platinum Level recognition for their commitment to the environment. LJ Crafted Wines is proud of their association with Surfrider Foundation, a grassroots non-profit environmental organization dedicated to the protection and enjoyment of the ocean, waves and beaches. We realize that we can’t solve all the world’s environmental issues, but we’re doing our part to to minimize the resource-intensive use of glass bottles. There was a time when bottle reuse was common practice. 6.5-ounce soda pop bottles were once refillable products that framed an iconic era, and milk bottles were ceremoniously collected empty, then as if by magic, redelivered full. We’ve borrowed a page from these bygone times to revisit a contemporary and sustainable packaging alternative to wine consumption. We know the routine use of sanitizing and refilling a bottle is far more energy and resource efficient than that of single use bottles, even when recycled. Reduce, reuse, refill! Reusable bottles are cost-competitive. We pass that savings on to you, our customers. Glass containers provides a protective and oxygen-free environment, something that many other packaging solutions and single-serve containers fall short of. We use lightweight, durable bottles using less raw materials for greater environmental benefits. Wines served direct from the barrel often taste better.